Okay, here's a new cover I just finished-a special edition of VENUS ON THE HALF SHELL by Phillip Jose Farmer. What a quirky and strange book!! The imagery was wild, but at the same time, it is not a "pulpy" book at all, so this affected my treatment of it. I did not want to spoil anything since it was so wild in spots. Also, I was a bit tired out from painting weird aliens and spaceships. So thanks in part of John Davis, who gave me some great ideas(he's a huge fan of the book) I went with this more prosaic approach. Dare I even say....MAINSTREAM? Nah, eccentric is better. 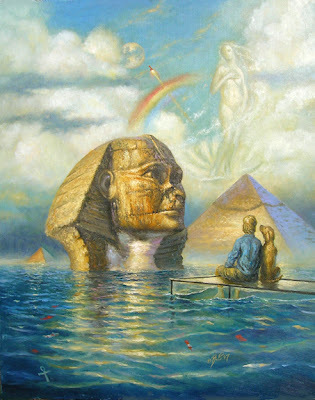 Anyway, I took some liberties showing The Sphinx(I always wanted an excuse to paint that statue!) but I figured how cool it would look flooded(as what happens as the book opens). The clear case the hero and the dog "Anubis" are sitting on is a museum case with a dead mummy inside of it.I wanted it to be a melange of imagery that one would think of as connected to the book. ODD imagery and that's just the start! Anyway, it was alot of fun to do and the publisher liked what I did, so that's always nice. I painted it 16x20 and in oils, the reflection part was just joy to paint. This month I feel really blessed with what I have to paint- I did a Heinlein, and this Farmer cover, and, next is another Heinlein and then a Stanislaw Lem. Do I dare touch the hem of such legends? Heidi-thanks!!! It was fun to do it! And now, the Farmers want to buy the painting, which is like..does it get better than that? No, I don't think it gets any better than that! A stunning cover--I love the elements you chose from the book and the way you arranged them. Perfect! Again, thanks. I was originally headed a more different way, and something far more "pulpy" but am glad I took this route.